CWind, a leading provider of power cable and asset management services to the offshore renewables and utilities market and part of the Global Marine Group, announced today a five-year cable repair framework agreement with leading offshore wind power developer and operator Vattenfall, covering their European assets. CWind’s cable repair service, which is part of the company’s Complete Cable Care solution, is designed to respond more quickly to emergency power cable damage, bringing new standards in readiness and rapid deployment to the industry. The framework, which covers cable repair, fault-finding and diving operations, is supported by Global Marine Group’s fleet of cable ships and crew transfer vessels. The primary support coming from the ASV Pioneer, a uniquely versatile vessel that is pre-mobilised, holding and maintaining a stock of universal power joints with access to qualified jointers, and is ready to respond quickly to Vattenfall in the case of a cable fault or incident. The ASV Pioneer is on permanent standby at CWind’s offshore service hub in Blyth, UK, ideally placed for many of Vattenfall’s European sites. The Pioneer barge offers customers such as Vattenfall flexibility in cable repair, including the ability to operate from the beach out to a depth of 50m. Vattenfall is one of the world’s largest generators of offshore wind power. 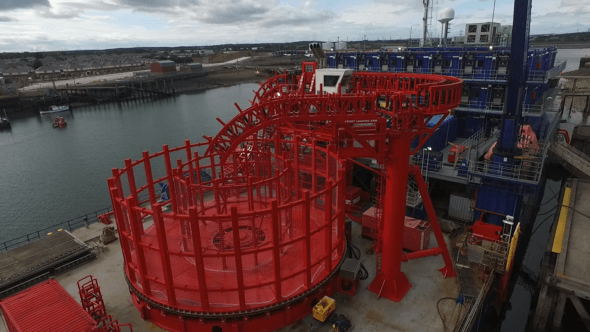 The company has a strong wind farm presence in the North Sea, Irish Sea and Baltic Sea, including Thanet, Kentish Flats and Ormonde in the UK, DanTysk and Sandback in Germany, Horns Rev 1 and the Kriegers Flak site currently in development in Denmark. All of these wind farms are part of the new five-year cable repair framework agreement. Prysmian Group, world leader in the energy and telecom cable systems industry, is leveraging on its strategic one-stop-shop solution provider approach to grow in the wind energy industry.